Edit: The problem is that when i browse to http:/mhlabs or https:/mhlabs it does not work. I get not found page of the browser. how can i get around that. Edit2: Ok, as a first step, i would like to forget ssl and just reserve a url for test-one on port 80 and run my site on this url. The logical steps that come to mind is that i reserve a url using netsh http add urlacl url=http://test-one:80/ user=everyone and add this entry in bindings section of applicationhost.config file. i also allowed port 80 through firewall but the whole thing does not seem to work for me. Any ideas? 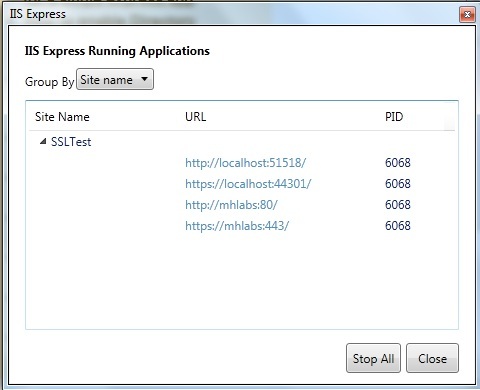 Are you starting iis express from command line or using WebMatrix? If you are not starting it from command line, try following steps and see if there are any binding errors. How to create a function for configuring defined ports on a stm32f4xx platform?